At D&F Welding we specialize in pipeline integrity along with pipeline and facility construction. We are built on a solid foundation of our management team and field personnel that strive to maintain top quality workmanship and build long-term relationships with our clients. We were founded in 1984 by Dean Schlosser operating a single welding truck, but would steadily grow to become much more. We have since experienced significant growth - adding more equipment and personnel to expand our service offering for clients and investing in digital technology to streamline overhead. 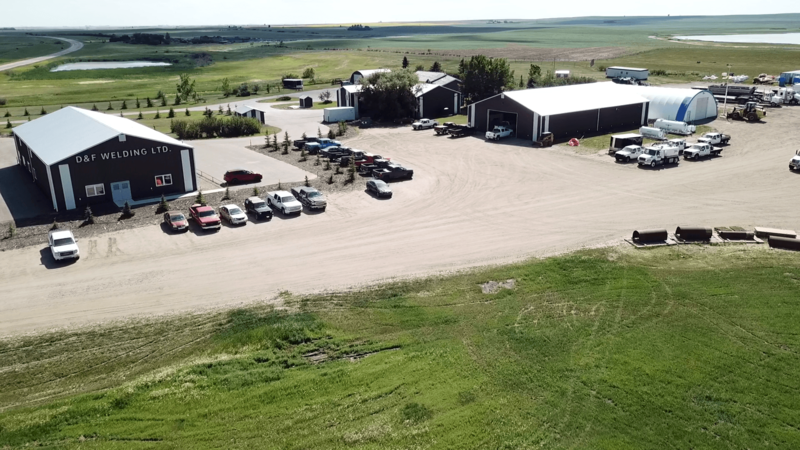 Our main office is located half a mile south of Kerrobert, Saskatchewan along Highway 21. If you have any questions feel free to contact us at (306) 834 - 5524 or visit our contact page for our mailing address and email addresses to get in touch. Sleeve repair up to 48" pipe. We have the ability to provide everything needed to construct access roads, hydrovac, weld, sandblast, coat, backfill, and reclaim any site. Up to 48" Mainline & Sales line, oil & gas gathering systems, linear pulls and preparation - steel, flexpipe, fiberglass, fiberspar, and polyethylene materials. Tank farms, ethanol plants, compressor stations, multi-well oil pads, batteries, satellites, DEHY's and separators.